Since my husband and I have been on our quest to consume fewer animal products, my slow cooker has had a little vacation. I was used to making meat-based roasts, stews and curries and it took a little while to find my way into veggie territory. I was determined, though, because you can’t beat the convenience of the slow cooker. I expected to find beans, beans, and nothing but beans! And while slow-cooked beans are indeed delightful, it turns out there is a whole world of delicious vegetarian and vegan slow cooking to play with, and it’s not brown and mushy as one might fear, but colorful and intensely flavored. This tortilla soup will make your whole home smell so smoky, spicy and delicious that you will hardly be able to wait to eat it. Get some really nice multi-grain tortilla chips to serve with it. My husband and I aren’t really vegan, so we had regular low-fat sour cream as a topping, but if you’re keeping it animal-free, just use vegan sour cream or skip it. I’ve adapted this recipe from Fresh from the Vegan Slow Cooker: 200 Ultra-Convenient, Super-Tasty, Completely Animal-Free Recipes. If you’re stuck for veggie slow cooker ideas like I was, this cookbook is great and chock full of things I want to make! Mix together the garlic, tomato paste, chipotle adobo sauce, and cumin in a small bowl. Transfer onion mixture to slow cooker. Stir in tomatoes and their juice, the vegetable broth, and season with a little sea salt and pepper (taste it to be sure you like the seasoning level). Cover and cook on low for 4-6 hours. Shortly before serving, stir in the cilantro. Taste and adjust seasonings if needed. 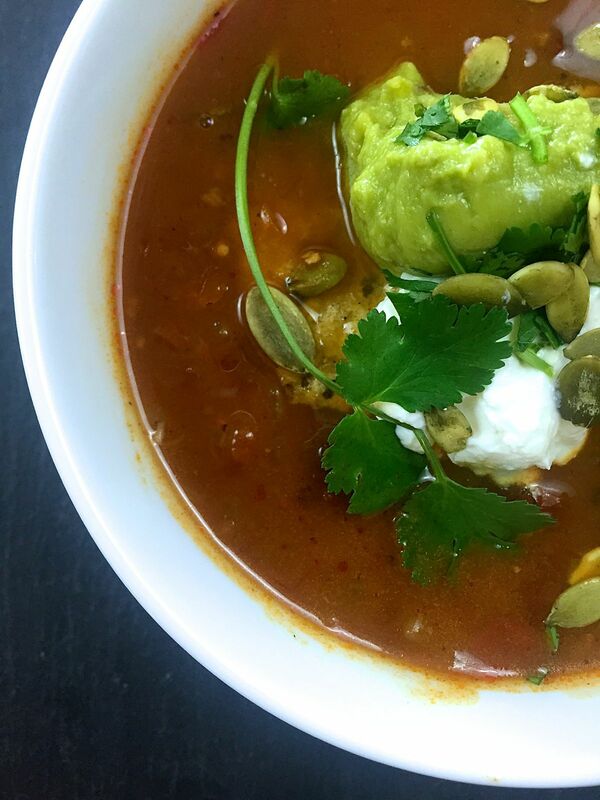 To serve, crush a handful of multi-grain tortilla chips in the bottom of each soup bowl, then ladle the soup over the top, and garnish with sour cream, guacamole or avocado, and toasted pepitas, and any remaining fresh cilantro. Enjoy! !